The first decision the new beekeeper must make is where to put the hive. There are different factors that make a beehive location successful. There are also other questions about location to consider. For one thing, try to choose a location that is as close to your home as possible. There are several reasons for this. The closer the hive is to your house, the more convenient your storage area will be and the less time you’ll spend traveling to and from your hive. If they are nearby, you will be able to inspect them more often. Occasionally, beehives are vandalized by thoughtless people who find a beehive in an isolated area an irresistible target for rock throwing or shotgun blasts. Therefore, having the beehive closer to your home or the home of some other responsible person provides greater security for the colony. 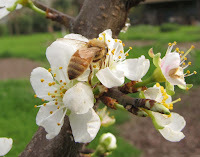 You need to make a careful study of available honey plants around a potential hive location. Honey bees get most of their nectar and pollen within a half-mile radius of their hive location. However, they can travel from one to two miles on their collection trips, depending upon the ruggedness of the terrain and the prevailing winds. Bees, like all animals, need a constant supply of water. It is best if there is a stream or pond in the vicinity of the beehive. A good source of water is especially necessary if your beehive is to be located close to neighbors’ homes. Otherwise, the bees may choose your neighbor’s water faucet, the children’s wading pool, or the bird bath for a source of water. To avoid having your bees become a nuisance, place a tub or pan of water near the hive, and your bees will learn to go only to that safe “watering hole.” Make certain that the water source has something in it the bees can land on without danger of drowning, such as cork floats, bark, or layers of crushed rock. There must be some water near the hive, but not too much. There should never be any possibility of the hive having to sit in water. Therefore, look for a spot with good drainage. Keep the hive off the ground using a hive stand or bricks and tilt it slightly forward. This will permit any moisture that may accumulate to run out the front entrance. Leaning the hive slightly forward also makes it easier for the bees to remove dead bees and other waste materials. When locating your bees, also consider available sunlight. Your hives should have as much sunlight as possible, especially during the winter months. Face your hive toward the south, where the entrance will have the greatest exposure to sunlight and will be protected from the cold north winds of winter. If your location makes it inconvenient to place the hives facing south, try facing them east to catch the morning sun. Finally, think about the vegetation immediately around your hive location. Trees to the west or north provide valuable protection from winter winds. You will want to keep the grass and weeds cut around your hive. This will reduce any danger of fire damage and provide good ventilation, which is necessary for the bees to maintain the proper hive temperature.